I have decided that carrots are my favorite vegetable. I am tired of Brussels sprouts, the "it" vegetable over the last few years, and though I have always loved cauliflower, especially roasted or in pasta w/ raisins, I think it's time for me to move on. How come no one appreciates carrots?? When I peel them I love the spicy aroma they give off....and when roasted, they become like candy. They are wonderful raw or cooked, honey glazed or with salsa verde. Today, let's roast them and toss them with some pomegranate molasses and feta cheese. Chopped nuts are always welcome. If you are not familiar w/ pomegranate molasses, then it's time you get acquainted. It is a staple in Middle Eastern kitchens and is great with eggplant recipes and Persian chicken dishes. It is not sweet, as you may think....you can find it at Middle Eastern markets or on amazon (of course!). Preheat the oven to 400F degrees. Line a baking sheet with parchment paper. 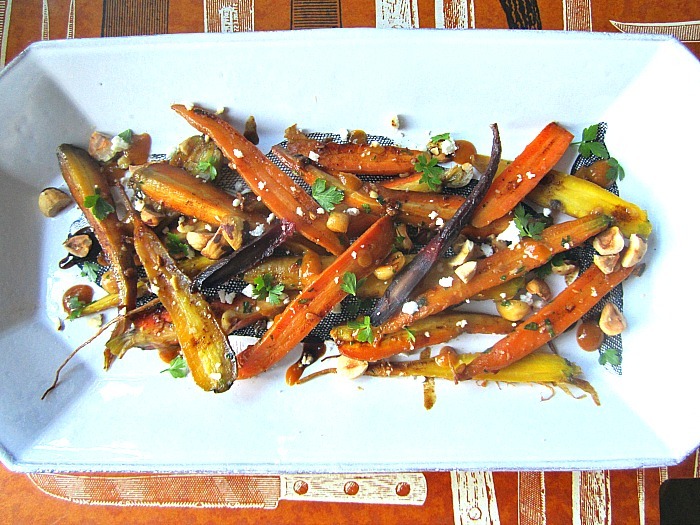 Place the carrots on the sheet and toss with the olive olive and 3 tablespoons of pomegranate molasses. Sprinkle with kosher salt and pepper. Roast for 15 minutes then toss, roasting for 10 to 15 more, or until they are caramelized, soft and golden. Remove the sheet from the oven. 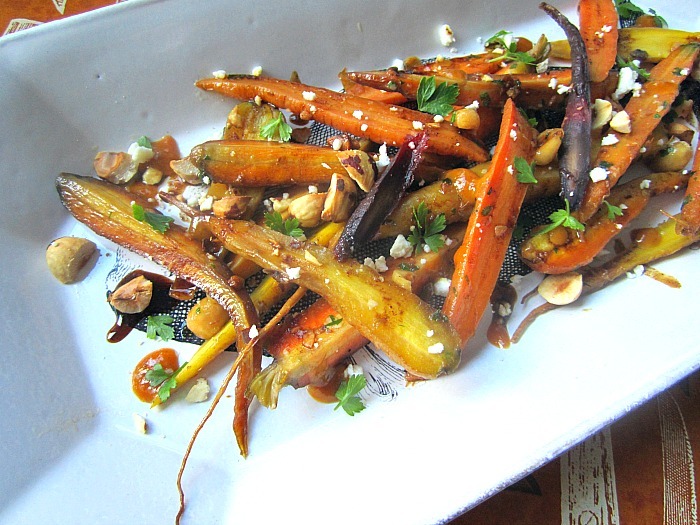 Drizzle the last tablespoon of molasses on top and sprinkle with herbs and toasted hazelnuts. I drizzled some melted butter mixed with a tsp of honey over the top just before serving. 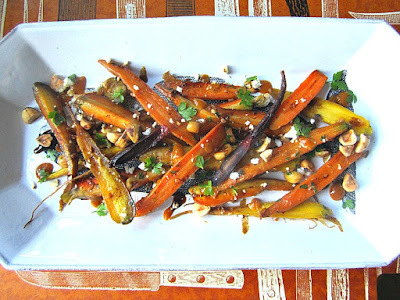 Before making Roasted Carrots with pistachios and sumac on Saturday, I wouldn't have related to your post. I get it now. Carrots are underrated. Looking forward to making this dish.